Many ground spiders can handle large or dangerous prey. They swathe their victims’ legs with threads that are coated with a tough glue, as Jonas Wolff and colleagues show. Ground spiders (Gnaphosidae) do not capture their prey by building a web, but hunt for them on the ground. For some of them, this is a risky venture because they aim for large or dangerous prey, such as ants and other spiders. Jonas Wolff and colleagues found out how they managed to capture these prey. 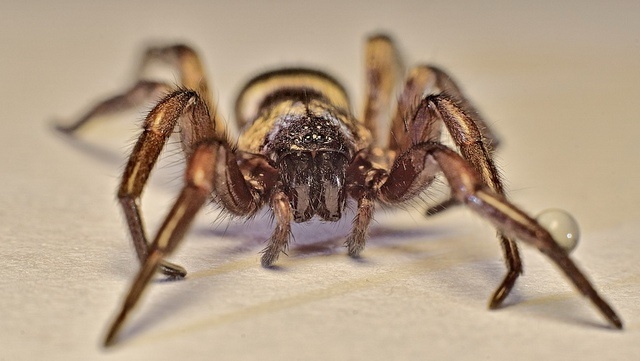 The researchers recorded the behaviour of a number of ground spiders during an attack with a high speed camera and analyzed the footage. When a ground spider perceives a prey, they observed, it first tries to grab it with its front legs. If it fails because the victim is large or dangerous, it quickly switches to another tactic and applies sticky silk threads to the soil and to the opponent’s legs and mouth parts to immobilise it; sometimes, an entangled prey spider still tries to defend itself by biting – hunting is never without risk. Other spider species don’t produce such sticky silk threads. Spider silk is made in glands, and comparing the silk glands of ground spiders that swathe the legs of their prey with those of other species, the researchers found clear differences. Spiders possess different types of silk glands, each of which makes another type of silk. The glands produce a liquid mixture of silk proteins and have a tapering duct ending in a nozzle-like opening (the spigot) on a spinneret; spiders have one to four pairs of spinnerets on their abdomen and make threads by pulling the protein mixture from the spigots. In most spider species, the largest pair of spinnerets bears the spigot of a single large ampullate gland. This gland produces the strong silk of which draglines are made: the structural threads of webs of web-building species and the drop lines that spiders make when they drop. In addition, there are the spigots of numerous tiny piriform glands; they produce short glue-coated fibres of which spiders spin attachment disks to link the threads of their web at the intersections, or to anchor a dragline to, for instance, a tree. In ground spiders that use sticky threads to capture their prey, the silk glands are strongly modified. The ampullate glands are relatively small, while the piriform glands are enlarged and have wide spigots. Ground spiders entangle their prey with the silk threads pulled from these enlarged piriform glands. The threads are coated with a layer of ductile, tough glue, perfect for swathing and immobilising struggling prey. So, ground spiders developed a novel use of piriform silk, and the morphology of the silk glands is adapted to this novel use. The consequence is that they are not able to make functional draglines and fully functional attachment disks. Like many other spider species, they build a silk shelter in which they hide (of yet another type of silk), but they can’t anchor that shelter to the substrate as well as other spider species do. That’s the price they have to pay for their exclusive hunting method.